rec. 5-7 January 2014, National Concert Hall, Taipei, Taiwan. Gordon Chin is one of Taiwan’s leading composers, music director of the Yin-Qi Symphony Orchestra and Chorus in Taipei, and a faculty member at the National Taiwan Normal University (NTNU). As a composer he has received commissions and performances from North America (where he studied), Asia and Europe. Now in his late fifties, he has produced a number of substantial compositions including an opera, four symphonies, numerous concertos and choral works. These two impressive examples of his music were written ten years apart and are here given their world premiere recordings. The three-movement Cello Concerto No.1 is placed first. Some literary quotations from Shakespeare, Pascal and Dr. Johnson, quoted by Chin in his own booklet note, aim to elucidate the expressive moods of each movement. I am not sure they are especially helpful in that respect, but the music hardly needs any literary support, so direct is its strength and immediate appeal. It is on a large scale and full of arresting orchestral incident. Its modernist idiom will present few problems to admirers of the cello concertos of Martinu or Shostakovich, for it is in an acerbically tonal style with many exotic effects, and punchy assertive gestures dominate. Yet this is clearly the statement of an individual voice. The orchestral colours are alluring and the cello solo is wide-ranging, idiomatic. It has quite a few challenges for the player – all of which cellist Wen-Sinn Yang has mastered. His dazzling virtuosity serves the work rather than the other way around. One hopes this disc will encourage other cellists to look at the music. 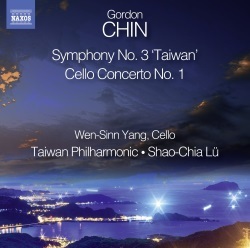 Symphony No.3 (subtitled Taiwan) is a dramatic work also cast in three movements, each of which explores the turbulent history of Chin’s native country. The first movement is subtitled Plunder, the second Dark Night and the third Upsurge. There are even motifs with such titles identified in the composer’s note, complete with musical illustrations. That first movement is almost a percussion extravaganza, becoming a timpani concerto at some points. The lyrical second movement draws upon a Taiwanese folk song, is punctuated by angry episodes and grows to a passionate climax. The finale pulls everything together in a satisfying way and leads to a heroic conclusion. The symphony is enjoyable and often striking, if at first slightly less compelling perhaps than the cello concerto. The performance of the excellent Taiwan Philharmonic under Shao-Chia Lü is certainly persuasive and sounds committed throughout. The recording is very good, full and well-balanced with plenty of impact. This disc will appeal to anyone curious to know what can be made of the western classical tradition when its techniques and colours are expertly refracted through an East Asian lens. It is to be hoped that Naxos, whose second disc of Chin’s music this is will continue the series. The first disc is Naxos 8.570221: Double Concerto and Formosa Seasons.